The Russian has become so much more important, rarely losing to mediocre players and raking the ball with power. Makarova isn’t super-fast but she moves better than she used to, can rip her forehands and backhands and is very consistent at the net. She can be had and can get nervous at times, but she is more mature now. But Makarova is not as talented as Halep, especially compared to what Simona has done over the past year and a half. The Romanian is quicker, more aggressive and steadier. There are times that she loses her control, but that has been the past now. Yes, Halep has to prove that she won’t back off a little bit, but she is too aggressive and thoughtful to go away. Halep will win in three sets. Sharapova is looking to beat Bouchard again in a Slam. The Canadian has hit her stride again and she really believes she can take down Sharapova for the first time. They have played three times, all wins for Maria. But the now 20-year-old Bouchard was basically a rookie. Yes, last year in the Roland Garros semis, Genie was old enough at that point to win. Still, Sharapova was smarter and she never backed off, winning 6-2 in the third set. The other day, Bouchard said she didn’t play that well overall, even though she almost beat her. Oh really? Now Sharapova will have heard about it, so she will go at her super hard. Clearly, Bouchard is ready to rumble, She is faster than Sharapova, but the Russian/American does so many other great things that against many other top players, speed really doesn’t matter. 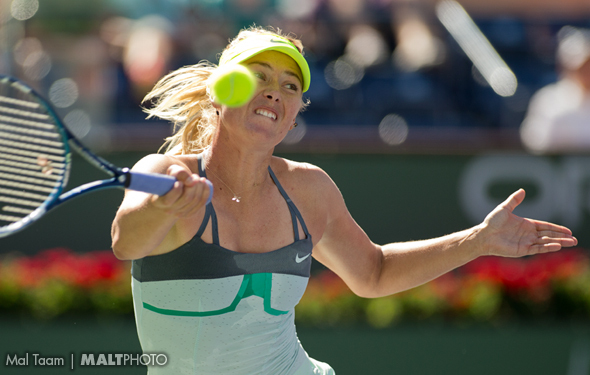 Sharapova hits as hard as she can off the baseline, inside and out. Bouchard says that she will go for it and not back off. I believe that as she has been super-solid since the start of the tournament. But that does not mean that Genie can kiss the lines at crush time. Sharapova will and take the contest in three tough sets. As the ITF notes, “Nadal going for 18th straight win over Berdych tomorrow. If he wins would be longest h2h (head-to-head) winning streak in Open Era history.” So does Tomas have a real chance? I doubt it, although sometimes, (remember Vitas Gerulatis vs. Ivan Lendl) it’s possible once or twice. However, Nadal had a tough 2014 after winning Roland Garros due to injury – again. But he has looked darnn good during the last two matches. He’s running like the wind, his forehand is phenomenal and he is returning super steady. Yes, Berdych is a huge hitter and he owns a gigantic first serve. But he is not good enough from the nets, he can’t depend on his forehand and is not much better than his backhand. There is nothing he can do unless Nadal falls apart. The Spaniard won’t and will win in four sets. Murray looked wonderful and intelligent and took down the ambitious Dimitrov. The Brit knew that the only way he was going to take down the creative Dimitrov was to change it up and that is exactly what he did. Murray is 27 years old and loves watching his own sport, which means that he knows just about everything and exactly what he has to do. That does not mean that he is perfect, not being able to hit every shot. But against most of the guys outside of the Big 3, he knows what he can do. That means that if Murray is healthy and is playing well, the young excellent player will have a lot of trouble. Without a doubt, the teenage Aussie Kyrgios has played excellent ball. He is tall, strong, can bash his first serve and can stroke his forehand and backhand. He appears to be a big deal. However, Murray is very good on his returns, even when he has to deal with a gigantic bomb that Kyrgios has. Yes, the Aussie will be loving the thousands of fans screaming for him on Rod Laver Arena, but Murray is too good for him now. Maybe the kids will be right there with him soon, but not yet as Murray will confuse him. It will be fun, but the Brit will win in four sets.